A hotel kitchen should be a high quality, efficient, and professional environment, similar to any restaurant kitchen. This is easily achieved when standards of cleanliness and sanitation are taken seriously and implemented on a daily basis. A filthy kitchen can be an open door to a myriad of serious problems that can put your guests, and your hotel, at risk. One of the main reasons to keep the kitchen in your hotel clean at all times is the dangerous risk of food borne illnesses and food contamination resulting from poor sanitation efforts. The restaurant industry is under greater scrutiny than ever because more and more consumers are affected by bacterial infections and food poisoning each year. The general fear of issues such as E Coli and Salmonella has made many customers wary of eating in any public dining establishment. Food poisoning and food contamination is usually caused by either the failure to cook meat and other raw ingredients thoroughly, or the result of cross contamination. Cross contamination is caused when food that can be served raw comes into contact with food that cannot be served raw. For example, if a knife that is used to cut raw chicken is used immediately afterwards to chop vegetables or slice bread, without cleaning it in between, cross contamination may occur. Similarly, if kitchen surfaces are not cleaned regularly, raw food may come into contact with a contaminated surface. A high standard of cleanliness is the only way to eliminate these risks. Another serious problem that can arise from a kitchen that is not kept spotlessly clean at all times is the infestation of rodents or other pests. Mice and rats are quite common in large kitchens simply because a larger kitchen means that the presence of crumbs, spills, and other messes is more likely to go unnoticed. Insects, such as ants and cockroaches, are attracted to these unnoticed messes. These rodents and insects can carry dangerous diseases, and the feces left behind by kitchen pests can be quite dangerous. If a health inspector detects signs of rodents or insects, the entire hotel can be shut down in an instant. As this would derail a hotel's hope for success resulting in a bad reputation among its guests, keeping a clean kitchen is vitally important for a hotel's survival. There are a few very simple ways to prevent cross contamination and eliminate the risk of pest infestation. First, surfaces and cutting utensils must be sterilized at regular intervals with a powerful disinfectant. Dishes, glassware, and silverware must be washed at extremely high temperatures in a commercial dishwasher to prevent the spread of germs. Floors must be swept and mopped after the preparation process for meals has ended. Also, food that is stored in refrigerators and pantries must be tightly sealed and impenetrable. 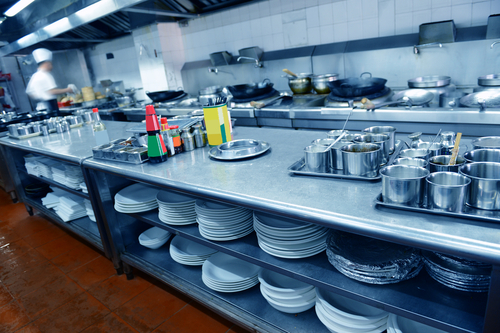 These standards will dramatically improve the cleanliness of your hotel kitchen and eliminate much of the risk associated with poor sanitation standards.